If you have reached a settlement agreement with your adjustor or with the other party and you were thus able to avoid litigation, you might expect that it is smooth sailing from this point on. However, there are several different issues that can emerge at the final stages of settlement negotiations. 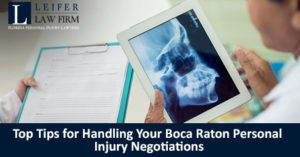 One of the best ways to prevent challenges is to work directly with an experienced Boca Raton personal injury attorney. Partnering with someone you can trust from the outset of your case is the best way to ensure that your rights are protected. It can be overwhelming and frustrating to realize that the injuries you have sustained in a serious car accident or other personal injury case will continue to impact you for years to come. Do not make the mistake of assuming you that you can handle this case on your own. Trying to do so may lead you to accept a settlement offer early on in the process from the other driver’s insurance company. There is a good chance that the adjusters in this individual case have determined that you may be overwhelmed by the situation and may choose to simply accept fast cash rather than carefully considering how your injuries may influence you for many years to come. One of the most important things you need to know is what happens when you sign the settlement release. In order to ensure that the settlement offer perfectly considers all of the injuries you have sustained after the accident, you should work with an experienced attorney who is committed to working for your best interests. Signing the release and getting your money may seem like the end of a long road. This is particularly true if you have sustained critical injuries that will influence your life for many years to come. Working with doctors and going through painful treatments and taking medications can certainly take its toll on any accident victim but you should never rush into signing a settlement agreement because you’re under the impression that it is in your best interests to do so. You need to make this decision after consulting directly with your personal injury attorney and considering what is truly best for you. Your Boca Raton personal injury lawyer can help advise you about the short term and long term costs associated with your personal injury claim. This may be the best way to protect you going forward as life after a car accident can be very difficult to recover from, even when you have an advanced medical team and comprehensive health insurance. Many car accident victims are shocked to learn that they are still experiencing pain and suffering many years after the accident has occurred. Don’t make the mistake of taking a settlement offer too soon and jeopardizing your ability to actually be able to pay for the medical care you’ll need years from now. The first step after agreeing to a settlement amount is to receive a confirmation letter. You will need to send an official letter about the verbal discussion you had with the adjuster. You should always get things in writing in your personal injury case and if you have hired the right Florida personal injury lawyer from the outset of your case, there is a good chance that he or she is advocating that this is in your best interests as well. Do not hesitate to reach out to a lawyer as soon as possible after the accident has happened as this is your best chance to ensure that your rights are being protected fully. A lawyer can evaluate all of the facts of your individual case and look at items like your medical records to consider how this accident might influence you for years from now. Having all of these materials in writing including your medical records, statements from witnesses, the police report and other details that help support the injuries you sustained in the accident is strongly recommended. It is recommended that you get letter certified as well so you can track that it was received and signed. In response to your letter, you should receive a release form from the insurance company within several weeks. In certain situations, you may also receive the settlement check at the same time as the release form. Usually this form will state that you must sign the form and return it before you are eligible to cash the check. Usually your Florida personal injury attorney will receive the check for you and will advise you about the steps you need to take. Never sign the release until you have confirmed that if property damage was initiated in your case, then you will be paid separately or that it was included as part of the settlement check you received. Property damage claims are typically resolved much sooner than personal injury claims but this is not always the case so you want to look at the release form carefully. If there is anything that confuses you in the release form, ask your Florida personal injury attorney to help explain it to you. Getting your questions answered sooner rather than later and certainly before you have the paperwork signed, is strongly recommended. Signing things too early and accepting the check could bar you from ever being able to file a claim in the future so you want to make sure that everything is appropriately handled the first time around. Do not hesitate to reach out to Leifer Law Firm to learn more about this process.